Context: Relative risk of non-Hodgkin lymphoma (NHL) in people living with HIV is 60–200 times that of normal population. This is the largest series from India on lymphomas arising in HIV-infected individuals including workup for Epstein–Barr virus (EBV) and human herpesvirus-8 (HHV-8). Aims: This study aims to ascertain the distribution and detailed clinicopathologic features of lymphoma arising in HIV-infected persons in India. Settings and Design: The study was done during the period of 2007–2011 in the pathology department of a tertiary care center in South India. Subjects and Methods: All cases diagnosed as lymphoma in the department of pathology during the study period were identified, and patients with HIV positive by serology were included in the study. Clinical details were obtained from electronic records, slides were reviewed and tissue blocks retrieved, and immunohistochemistry for HHV-8 and in situ hybridization for EBV-encoded RNA was done. Statistical Analysis Used: Descriptive statistics were done using SPSS software. Kaplan–Meier curves were used to do survival analysis. Results: Of 3346 patients diagnosed with lymphoma, 73 (2%) were diagnosed to be positive for HIV. About 87.6% of the cases were NHL, of which diffuse large B-cell lymphoma was the most common and plasmablastic lymphoma was the second common subtype. Survival was uniformly poor in 36% of the cases where follow-up was available. Conclusions: The striking differences from world literature included higher frequency of plasmablastic lymphomas, lack of primary central nervous system lymphomas, and low association with HHV8. Malignancies are more common in immunocompromised individuals as compared to the general population. In developed countries, 34% of AIDS patients suffer from aggressive malignancies which are resistant to treatment and are often fatal. On the other hand, in India, the incidence of malignancies in patients with HIV is only 3%–4% which is attributed to underdiagnosis and early deaths from opportunistic infections. The majority of AIDS-related malignancies are associated with oncogenic viruses such as Epstein–Barr virus (EBV), HHV8, and HPV. Among these, EBV has a strong causal relationship. EBV most commonly infects B-lymphocytes and leads to a wide range of B-cell NHL and Hodgkin lymphoma. Sixty-six percent of AIDS-related lymphomas are EBV associated, and in most EBV-positive AIDS-related lymphomas, all recognizable tumor cells express EBV-encoded RNA (EBER). The study was performed in the Department of Pathology, Christian Medical College and Hospital, Vellore, India. The study period was 5 years from January 2007 to December 2011. All lymphoma cases diagnosed in our department over this 5-year period were identified, and among these, only the patients who were positive for HIV by serology (ELISA) were included in this study. The tissue blocks were obtained from the archives of our department, and the patients' clinical details were obtained from the clinical workstation and from patients' charts obtained through medical record department or from the biopsy request forms for outside referral biopsies. Immunohistochemistry was done on 62 cases for which the tissue was adequate, using the Ventana automated immunostainer using the manufacturer protocol. In situ hybridization was done to detect the expression of EBER in paraffin sections also in the Ventana automated stainer. [Table 1]a and [Table 1]b gives the list of primary antibodies, their source, and dilutions used. A total of 3346 lymphomas were diagnosed during a 5-year period, January 1, 2007–December 12, 2011. Of these, 73 patients (2%) were found to be positive for HIV infection by serology (ELISA). The rest of them were seronegative or biopsies from outside hospitals with HIV status unknown. The median age of presentation was 40 years (range 8–66 years). There was a definite overall male preponderance, males – 74% (n = 54) and females – 26% (n = 19) with male-to-female ratio of 2.8:1. These lymphomas most commonly involved lymph node (56% [n = 41]) as the primary site of presentation and a high frequency of extranodal sites as well (44% [n = 32]). Among the nodal sites, axillary (32.5% [n = 13]) was the most common site, followed by cervical (30% [n = 12]), abdominal (15% [n = 6]), inguinal (5% [n = 2]), supraclavicular (2.5% [n = 1]), and tonsillar (2.5% [n = 1]) lymph node. Lymph node site was not known in 5 cases (12.5% [n = 5]). Among the extranodal sites, the most common primary sites were the gastrointestinal tract and liver 19% each (liver, n = 6; stomach, n = 3; small intestine, n = 2; and large intestine, n = 1), followed by soft tissue 16% (chest wall, n = 2; trunk, n = 1; thigh, n = 1, and retroperitoneum, n = 1), upper aerodigestive tract 13% (n = 4), oral cavity 9% (n = 3), and other less common sites including ischiorectal fossa, orbit, pleura, submandibular region, perianal region, and omentum, constituting 3% each (n = 1 each). B symptoms were present in 78% (n = 57) of the patients. Hepatomegaly was seen in 50% (n = 34) and splenomegaly in 47% (n = 32) of the cases. There were no cases of central nervous system (CNS) lymphoma. Marrow involvement at presentation was seen in 37% (n = 18) of all lymphomas; 87% (7 of 8 cases) in Hodgkin lymphoma and 27% (11 of 41 cases) in NHL. Serum LDH level was elevated in 89.5% of the cases with a mean value of 2356 IU/L (n = 51). The mean CD4+ T-lymphocyte count was 195 cells/μL (range = 14–872). The mean CD4 count was lowest in plasmablastic lymphoma (89 cells/μL) and highest in diffuse large B-cell lymphoma (DLBCL) (251 cells/μL). NHL (87.6%; n = 73) was more common than Hodgkin lymphoma (12.4%; n = 9). Of the 73 HIV-positive patients, DLBCL was the most common subtype (46.6%; n = 34 cases), followed by plasmablastic lymphoma (16.4%, n = 12 cases), Burkitt lymphoma (15%, n = 11 cases), peripheral T-cell lymphoma not other specified (NOS) (4%, n = 3 cases), high-grade NHL, unclassified (1.4%, n = 1 case), extracavitary primary effusion lymphoma (PEL) (1.4%, n = 1 case), extranodal NK/T-cell lymphoma (1.4%, n = 1 case), and anaplastic large cell lymphoma (1.4%, n = 1 case) [Figure 1]. Hodgkin lymphoma constituted 12.4% (n = 9) of cases. Of these, the most common subtype was mixed cellularity, 89% (n = 8 cases) followed by nodular sclerosis, 11% (n = 1 case). There were no cases of lymphocyte depleted, lymphocyte-rich, or nodular lymphocyte predominant type Hodgkin lymphoma. In all subtypes, male predominance was seen. EBER in situ hybridization was done in 60 cases. Among these, 47% (n = 28) were positive and 53% (n = 32) were negative. EBV LMP1 immunohistochemistry was done in 62 cases, among which 23% (n = 14) were positive and 77% (n = 48) were negative. EBV LMP1 was positive in only 13 of 28 cases that were positive for EBER-ISH. The overall positivity for EBV by EBV LMP1 and EBER-ISH was 47% (29 of 62 cases). Of these, 20 cases were NHLs (38% positivity; 20 of 53 cases of NHL) and 9 cases were Hodgkin lymphoma (100% positivity; all 9 cases of HL). Among the different subtypes of NHLs, the proportion of cases that were positive for EBV was as follows: 8 of 27 (29.6%) DLBCLs, 1 of 10 (10%) Burkitt lymphomas, 9 of 10 (90%) plasmablastic lymphomas, 1 of 2 (50%) PTCL NOS, 1 extranodal NK/T-cell lymphoma, and 1 extracavitary PEL. All 8 cases (100%) of Hodgkin lymphoma tested for EBV were positive. KSHV-LANA immunohistochemistry was done in 62 cases, out of which only 1 (1.6%) was positive and the rest were negative. This single positive case was extracavitary PEL involving the stomach and small intestine. DLBCL was the most common subtype and constituted 46.6% (34 of 73 cases). Of these, 26 cases were of centroblastic type, 6 cases of immunoblastic type, and 2 cases with anaplastic morphology. Two children (an 8-year-old female and a 14-year-old male) had centroblastic type of DLBCL. The 8-year-old child presented at Stage IVB disease with a very high LDH value of 5959 IU/L and trephine biopsy showed tumor cells with positivity for EBER-ISH. This child died within 3 months of diagnosis in spite of chemotherapy. The other 14-year-old male child presented at Stage II with B symptoms and negative for EBER-ISH and was lost to follow-up. Plasmablastic lymphoma constituted 16% (12 of 73 cases) forming the second common type. The most common site of involvement was extranodal, constituting 92% (11 of 12 cases). Of these, the most common site was oral cavity [Figure 2], 27% (3 of 11 cases). Burkitt lymphoma constituted 15% (n = 11). There were no pediatric Burkitt lymphomas in this study. Hodgkin lymphoma also constituted 12% (9 of 73 cases). There was only a single case of extracavitary PEL, constituting only 1.3% of all HIV-associated lymphomas. This was a male patient with 66 years of age at presentation. Gastrointestinal tract was the primary site, involving both stomach and jejunum. The lymphoid cells were CD20+ and CD30+. The MIB-1 labeling index was 95%. EBER-ISH and KSHV-LANA were positive [Figure 3]. Staging was done for 72 patients. Among this, 69% (n = 50) of the patients presented with widespread disease (Stage III/IV) and 31% (n = 22) presented at an early stage (stage I/II). Among the patients with Hodgkin lymphoma, 89% (n = 8; Stage IV-7; Stage III-1) of the cases presented with advanced stage. IPI scoring was done only in 54 of 64 NHLs. Of these, 54% (29 of 54 cases) had high/high intermediate score and 46% (25 of 54 cases) had low/low intermediate score. Follow-up was available for 36 patients. The clinical course was aggressive in most patients. Thirteen patients (36%) died during the disease course, among which 12 died within first 3 months and 1 died in 6 months. Ten patients are in remission until the recent follow-up with a maximum survival period of 5 years after diagnosis. One patient developed CNS relapse at 18 months. Two patients developed disease relapse, disease was progressive in 4 patients, and 7 patients were in remission until the last follow-up and lost to follow-up after 3 months (1 patient), 6 months (2 patients), 1 year (3 patients), and 18 months (1 patient). HAART was given to 43 out of 73 patients as per the hospital records. Among these, 3 patients died; 2 (DLBCL and PBL) in the 3rd month and 1(CHL Stage IV with CNS involvement) in the 6th month. Fifteen patients were in remission until the last follow-up (maximum 67 months). Three patients showed partial response at the last follow-up and rest of the patients (n = 22) were lost to follow-up. Twenty-four patients did not receive HAART. Follow-up details were available for only 10 of the 24 patients. Among these 10 patients, 8 died within 3 months of follow-up and other 2 showed no response to treatment on follow-up (up to 3 months, after which there is no follow up). For 6 patients, there is no record after diagnosis (no visit after biopsy), so treatment details are not known. The main histological subtype of NHL in AIDS patients in the pre-HAART era was DLBCL, constituting ~50% of the total cases, followed by Burkitt lymphoma and immunoblastic DLBCL.,, In our series, DLBCL was the most common lymphoma (46.6%) followed by plasmablastic lymphoma (16%) and Burkitt lymphoma (15%). In our series, nodal lymphomas constituted 56% and extranodal locations constituted 44%. HIV-associated lymphomas are reported to be more common among males (male:female ~4.8:1), with median age of 38.5 years (range = 14–67 years).,, Similar trends were seen in the current study. Occasional cases of children with AIDS-related lymphoma have also been reported. They usually presented with severe immunosuppression and high viral load. Median survival time is low, ~5.8 months. 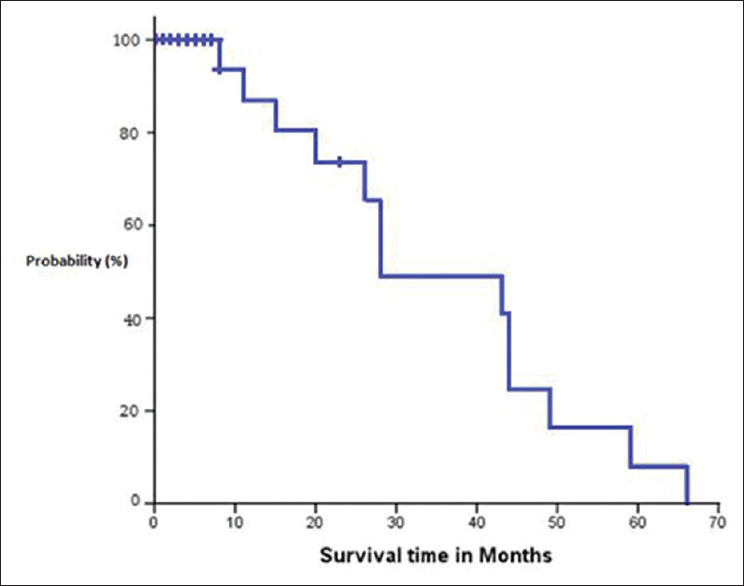 Survival was uniformly poor in 36% of the cases on whom the follow-up was available with a median survival of 28 months [Figure 4]. In literature, the median survival (14 months vs. 4.8 months) and the remission rate for chemotherapy (58% vs. 14%) was better among the individuals with HIV-NHL who received HAART when compared to the similar population who did not receive HAART. In the developing countries, the risk of developing lymphoma in HIV-infected individuals is 10 times less than that in the developed countries (RR of 400 for high-grade NHL) probably because of underdiagnosis and early death from opportunistic infections., India has a large number of people living with HIV/AIDS, being the second highest in the world. In spite of this, only a sparse data are available on HIV-related malignancies, especially the lymphoid malignancies, possibly due to underdiagnosis and inadequate reporting system. Therefore, there is a need to improve epidemiological data collection system in our country. This is the largest detailed clinicopathological study of HIV-associated lymphomas from India. 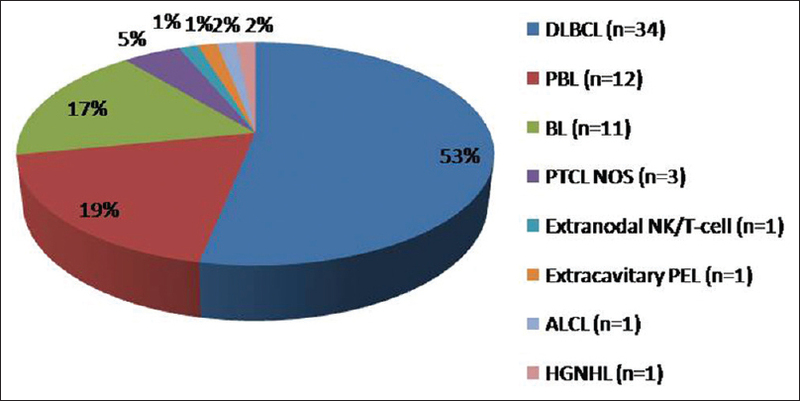 DLBCL was the most common type of HIV-associated lymphoma followed by plasmablastic lymphoma, Burkitt lymphoma, Hodgkin lymphoma, PTCL-NOS, ALCL, extranodal NK/T-cell lymphoma, and extracavitary PEL. Most cases were nodal though there were a large number (44%) of extranodal primary sites involved. Most cases (69%) presented with high stage disease. EBV association was seen in 47% of cases. Plasmablastic lymphomas and Hodgkin lymphoma were most often associated with EBV (90% and 100%, respectively). There were significant differences between lymphomas in HIV-positive individuals and lymphomas in HIV-negative patients, the former being more aggressive types with high stage at presentation, more frequent extranodal involvement, EBV association, and poor survival. The striking differences from world literature included the higher frequency of plasmablastic lymphomas, lack of primary CNS lymphomas, and low association with HHV8 (LANA immunohistochemistry) in our patients. This study was financially supported by fluid research grant from Christian Medical College, Vellore, after obtaining ethical clearance from the institutional review board. Chitale AR. Cancer and AIDS. Indian J Pathol Microbiol 2005;48:151. Levine AM. AIDS-related malignancies: The emerging epidemic. J Natl Cancer Inst 1993;85:1382-97. Beral V, Peterman T, Berkelman R, Jaffe H. AIDS-associated non-hodgkin lymphoma. Lancet 1991;337:805-9. Engels EA, Biggar RJ, Hall HI, Cross H, Crutchfield A, Finch JL, et al. Cancer risk in people infected with human immunodeficiency virus in the United States. Int J Cancer 2008;123:187-94. Kumarasamy N, Vallabhaneni S, Flanigan TP, Mayer KH, Solomon S. Clinical profile of HIV in India. Indian J Med Res 2005;121:377-94. Dhir AA, Sawant S, Dikshit RP, Parikh P, Srivastava S, Badwe R, et al. Spectrum of HIV/AIDS related cancers in India. Cancer Causes Control 2008;19:147-53. Venkatesh KK, Saghayam S, Devaleenal B, Poongulali S, Flanigan TP, Mayer KH, et al. Spectrum of malignancies among HIV-infected patients in South India. Indian J Cancer 2012;49:176-80. Clifford GM, Franceschi S. Cancer risk in HIV-infected persons: Influence of CD4(+) count. Future Oncol 2009;5:669-78. Biggar RJ, Chaturvedi AK, Goedert JJ, Engels EA; HIV/AIDS Cancer Match Study. AIDS-related cancer and severity of immunosuppression in persons with AIDS. J Natl Cancer Inst 2007;99:962-72. Bonnet F, Balestre E, Thiébaut R, Morlat P, Pellegrin JL, Neau D, et al. Factors associated with the occurrence of AIDS-related non-hodgkin lymphoma in the era of highly active antiretroviral therapy: Aquitaine cohort, France. Clin Infect Dis 2006;42:411-7. Engels EA, Pfeiffer RM, Goedert JJ, Virgo P, McNeel TS, Scoppa SM, et al. Trends in cancer risk among people with AIDS in the United States 1980-2002. AIDS 2006;20:1645-54. Ruiz M. Certain non-AIDS-defining cancers higher in HIV population. HIV Clin 2009;21:13-6. Vishnu P, Aboulafia DM. AIDS-related non-hodgkin's lymphoma in the era of highly active antiretroviral therapy. Adv Hematol 2012;2012:485943. Bower M. AIDS-related cancers. Medicine (Baltimore) 2009;37:338-41. Bibas M, Antinori A. EBV and HIV-related lymphoma. Mediterr J Hematol Infect Dis 2009;1:e2009032. Patel RM, Goldblum JR, Hsi ED. Immunohistochemical detection of human herpes virus-8 latent nuclear antigen-1 is useful in the diagnosis of kaposi sarcoma. Mod Pathol 2004;17:456-60. Deloose ST, Smit LA, Pals FT, Kersten MJ, van Noesel CJ, Pals ST, et al. 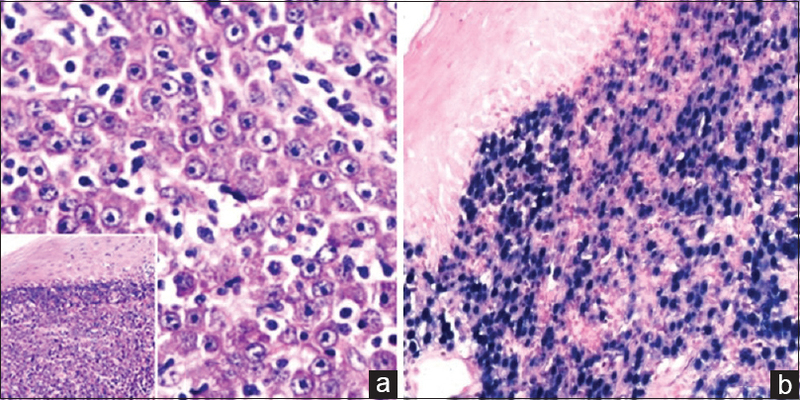 High incidence of kaposi sarcoma-associated Herpesvirus infection in HIV-related solid immunoblastic/plasmablastic diffuse large B-cell lymphoma. Leukemia 2005;19:851-5. Dhir AA. HIV-associated non-hodgkin's lymphoma: How much do we know? Indian J Cancer 2010;47:6-7. Sharma A, Bajpai J, Raina V, Mohanti BK. HIV-associated non-hodgkin's lymphoma: Experience from a regional cancer center. Indian J Cancer 2010;47:35-9. Dhir AA, Sawant SP. Malignancies in HIV: The Indian scenario. Curr Opin Oncol 2008;20:517-21. Rojas HC, Merino MC, Ghiringhelli MJ, Rodríguez AJ, Martínez LF, Jensen RW, et al. Lymphomas associated with human immunodeficiency virus infection: Retrospective review of medical records. Rev Med Chil 2011;139:27-35. Kaplan LD. HIV-associated lymphoma. Best Pract Res Clin Haematol 2012;25:101-17. Bolarinwa RA, Ndakotsu MA, Oyekunle AA, Salawu L, Akinola NO, Durosinmi MA, et al. AIDS-related lymphomas in Nigeria. Braz J Infect Dis 2009;13:359-61. Zhang YX, Gui XE, Zhong YH, Rong YP, Yan YJ. Cancer in cohort of HIV-infected population: Prevalence and clinical characteristics. J Cancer Res Clin Oncol 2011;137:609-14. Riedel DJ, Rositch AF, Redfield RR, Blattner WA. HIV-associated lymphoma sub-type distribution, immunophenotypes and survival in an urban clinic population. Leuk Lymphoma 2015;57:1-7. Navarro WH, Kaplan LD. AIDS-related lymphoproliferative disease. Blood 2006;107:13-20. Swerdllow SH, Campo E, Harris NL. WHO Classification of Tumours of Haematopoietic and Lymphoid Tissues. France: IARC Press; 2008. Gabarre J, Raphael M, Lepage E, Martin A, Oksenhendler E, Xerri L, et al. Human immunodeficiency virus-related lymphoma: Relation between clinical features and histologic subtypes. Am J Med 2001;111:704-11. Agarwal B, Ramanathan U, Lokeshwas N, Nair R, Gopal R, Bhatia K, et al. 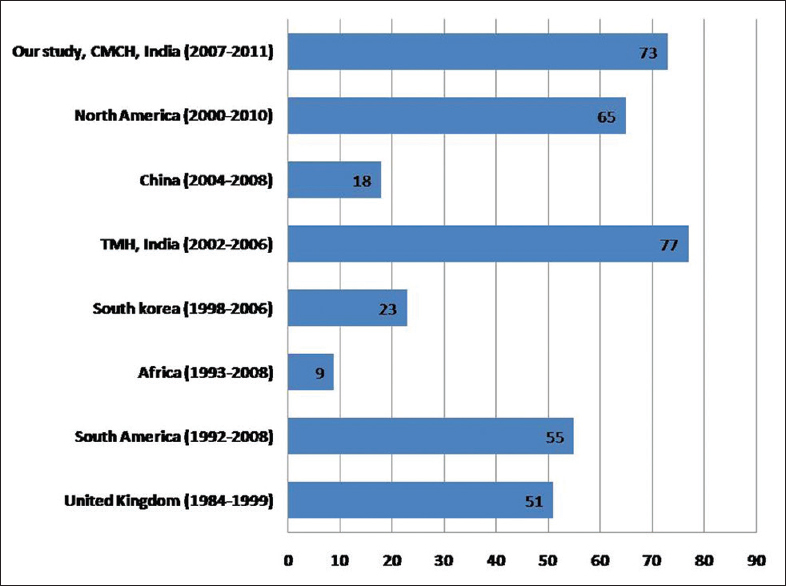 Lymphoid neoplasms in HIV-positive individuals in India. J Acquir Immune Defic Syndr 2002;29:181-3. Corti M, Villafañe M, Bistmans A, Narbaitz M, Gilardi L. Primary extranodal non-hodgkin lymphoma of the head and neck in patients with acquired immunodeficiency syndrome: A clinicopathologic study of 24 patients in a single hospital of infectious diseases in Argentina. Int Arch Otorhinolaryngol 2014;18:260-5. Hishima T, Oyaizu N, Fujii T, Tachikawa N, Ajisawa A, Negishi M, et al. Decrease in Epstein-Barr virus-positive AIDS-related lymphoma in the era of highly active antiretroviral therapy. Microbes Infect 2006;8:1301-7. Mounier N, Spina M, Gabarre J, Raphael M, Rizzardini G, Golfier JB, et al. AIDS-related non-hodgkin lymphoma: Final analysis of 485 patients treated with risk-adapted intensive chemotherapy. Blood 2006;107:3832-40. Cabrera ME, Silva G, Soto A, Roselló R, Castro C, Martínez V, et al. HIV-related lymphoma in a public hospital in Chile. Analysis of 55 cases. Rev Med Chil 2012;140:243-50. Phatak UA, Joshi R, Badakh DK, Gosavi VS, Phatak JU, Jagdale RV, et al. AIDS-associated cancers: An emerging challenge. J Assoc Physicians India 2010;58:159-62. Godot C, Patte C, Blanche S, Rohrlich P, Dollfus C, Tabone MD, et al. Characteristics and prognosis of B-cell lymphoma in HIV-infected children in the HAART era. J Pediatr Hematol Oncol 2012;34:e282-8. Cornejo-Juárez P, Volkow-Fernández P, Avilés-Salas A, Calderón-Flores E. AIDS and non-hodgkin's lymphoma. Experience at an oncological center in Mexico. Rev Invest Clin 2008;60:375-81. Dal Maso L, Franceschi S. Epidemiology of non-hodgkin lymphomas and other haemolymphopoietic neoplasms in people with AIDS. Lancet Oncol 2003;4:110-9. Franceschi S, Dal Maso L, La Vecchia C. Advances in the epidemiology of HIV-associated non-hodgkin's lymphoma and other lymphoid neoplasms. Int J Cancer 1999;83:481-5. Available from: http://www. 20121120_UNAIDS_Global_Report_2012_en.pdf. [Last accessed on 2017 Jun 20]. Gopal S, Martin KE, Richards KL, Eron JJ. Clinical presentation, treatment, and outcomes among 65 patients with HIV-associated lymphoma treated at the university of North Carolina, 2000-2010. AIDS Res Hum Retroviruses 2012;28:798-805. Gujral S, Shet TM, Kane SV. Morphological spectrum of AIDS-related plasmablastic lymphomas. Indian J Pathol Microbiol 2008;51:121-4. Kim JS, Kim SJ, Kim JS, Kim ES, Shin HJ, Chung JS, et al. Report of AIDS-related lymphoma in South Korea. Jpn J Clin Oncol 2008;38:134-9. Wilks D, Boyd A, Clutterbuck D, Krajeski A. Clinical and pathological review of HIV-associated lymphoma in Edinburgh, United Kingdom. Eur J Clin Microbiol Infect Dis 2001;20:603-8.